Candy canes are one of the most iconic treats of winter. Here at Fun Family Crafts, we’ve gathered three dozen of the best crafts that are made from candy canes or look like candy canes! There are crafts that kids of all ages will enjoy (and plenty that parents will love, too!). 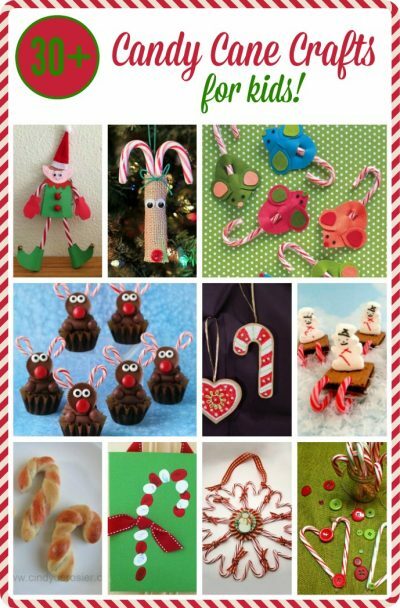 You can see all the candy cane crafts for kids here. Here are ten of our very favorite candy cane crafts. You can see all 30+ here. 1. Burlap and Candy Cane Reindeer – Use burlap and candy canes to make an adorable reindeer ornament. This easy project is a fun activity for any winter get-together. 2. Candy Cane Soft Pretzels – This delicious bread looks just like candy canes but tastes like soft pretzels. They’re easy to make and such a festive addition to a winter meal! 3. Candy Cane Elf Ornament – This cute elf starts with two candy canes. He looks great hanging on the Christmas tree, propped up on the mantle, or greeting visitors at the door. 4. Sledding Snowman S’mores – Marshmallow Peeps, candy canes, chocolate and graham crackers come together to make this fun and tasty treat. It has all the flavors of you love in summer combined with winter’s candy canes. 5. Candy Cane Christmas Wreath – This pretty candy cane wreath makes a great decoration or gift. It’s fast, easy and fun, plus you have a choice of eating it or storing it for next year! 6. Chocolate Reindeer Cupcakes -Decorate ordinary chocolate cupcakes with adorable Reese’s Reindeer. Everyone will love their bright red candy noses and candy cane antlers. 7. Fingerprint Candy Cane Canvas – A fingerprint candy cane make an adorable holiday keepsake. Try the same technique on cardstock to create thank-you notes after gifts are opened. 8. Faux Christmas Cookies -These Christmas cookies might look good enough to eat, but they are actually made of craft foam. They make wonderful ornaments or gift toppers. 9. Candy Cane Mice -These cute felt mice creatures with their red-and-white-striped tails make wonderful party favors or stocking stuffers. 10. Heart Candy Cane Ornaments -These heart-shaped ornaments are made from candy canes and buttons. Each takes only a few seconds to create, making them a perfect gift for classmates, teammates or other large groups. Don’t forget to browse through all the candy cane kids’ crafts for dozens of fun ideas!